You don’t have to be a royal to look like one. Which will elevate everything you wear. 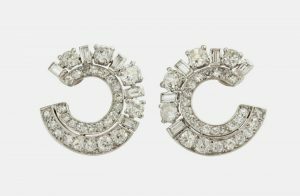 These ultra-deco “creole” style earrings that were designed by Juliette Moutard for the House of Boivin in 1935 have diamonds in front and back of the lobe. The diamonds have varied cuts. 10.40 grams, 2.2 cm. With Certificate of Authenticity from Francoise Cailles. A geometric platinum frame surrounds old European single cut round diamonds in this elegant Cartier pin. Signed Cartier and numbered. 1 in. tall by 1 in wide. Ca. 1930’s. The detachable, mismatched pearl pendants make these earrings both versatile and chic. 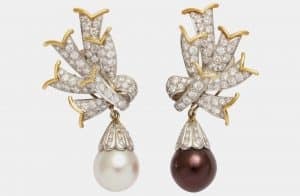 The stylized diamond ribbon knots are iconic Schlumberger, which make a fabulous earring solo without the drops as well. 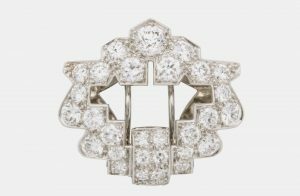 Signed Schlumberger for Tiffany, ca. early 1970’s.